Q: First Year Strawberry Production? What kind of production can you expect off the first year of a plant propagated from a runner? Answer to: First Year Strawberry Production? Strawberry production varies greatly depending on the climate, cultivar, and conditions in which you grow the strawberry plants. If you are asking about production during the first year a plant is in the ground (if planted in the spring), you shouldn’t get any production. The flowers should be pinched off to ensure maximal root establishment and maximum flower bud formation for harvest the following year (see the Growing Strawberries page for more information). If you are asking about a runner plant that establishes itself (or is planted) prior to winter, the following spring should bring a full harvest from your plants. In general, however, an established strawberry plant can be expected to produce about one quart of strawberries (see this on How Many Strawberry Plants to Feed a Family). can I eat my strawberries the first year? Hi I live in the north east part of america. I started planting my strawberries this spring (when I bought them they were already growing plants so I didnt use seeds) and a few of them have grown beautiful small red strawberries. I was just wondering if its okay for my family and I to eat them the first year? I am very new at this. I don’t know where to “pinch” the plants. I am confusted at how far the runner is supposed to go before placing a rock on top of it(???). And then I am supposed to clip it off somewhere after a few days? The strawberries I planted for the first time produced a few berries which was a surprise to me. But now that they are planted I need help (in a simpler form) in maintaining them for the duration of the summer, fall and winter. Thank you in advance. You can place a rock or other weight anywhere along the runner. The purpose of the weight is to keep the runner’s root in contact with the dirt. As that happens, the root will grow downward into the soil. As the root grows downward, it will begin drawing nutrients up from the dirt itself instead of drawing them through the runner from the mother plant. Once this happens (the daughter plant starts drawing nutrients from the soil), the plant is said to be “established.” After a daughter plant has established itself, the rock/weight can be removed (the roots will hold the plant in place now), and the runners can be snipped or snapped. Anywhere along the runner will be sufficient. As long as it is severed, it doesn’t matter exactly where you break the runner. 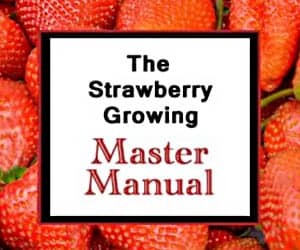 For maintenance, the most complete reference is the Growing Strawberries guide. A simpler summary that reviews what to do each month can be found here: Monthly Guide. Good luck! I planted quite a few big, healthy Ozark Beauty plants this spring. I was prepared to pinch off any buds to give them a good start. Well, aside from the few buds that were on the plants when I bought them, there were no blooms all season. The plants grew huge though and sent out so many runners, I finally stopped pinching them back and just let them go for it. I had amended the soil very heavily with goat manure before planting so I thought maybe it was just a case of over-fertilization. However, I also planted Loran plants in the same raised bed and they have produced masses of fruit all season under the same conditions. The plants are so big and healthy that I just decided to let them produce. Any idea of why the Ozark Beauty plants have just grown masses of foliage but no flowers while the Loran’s have fruited like crazy? Are they likely to produce next spring? Do they need a special fertilizer or amendment? Ozark Beauty runner plants often do not set fruit in their first year (see here for more on the plants: Ozark Beauty). So, if the Loran variety did well and the Ozarks were otherwise healthy, they should produce fine next year. Some other potential reasons strawberry plants don’t produce: No Strawberry Production. Good luck!